Award-winning children’s entertainers and Colorado family favorites Jeff & Page are poised to take center stage on the national scene with their fifth kid-friendly exploration of science and nature, Mighty Wolf, released on November 20. 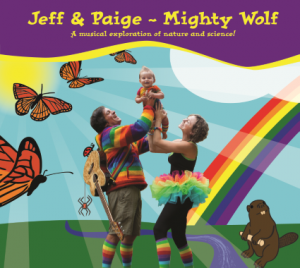 Winner of the prestigious Parents’ Choice® and Creative Child Magazine Awards, Jeff & Paige have perfected a playful performance style that combines the duo’s vivid storytelling and first-rate musical abilities to capture their love of the outdoors and respect for ecology. Within the setting of a family hiking expedition, Mighty Wolf features songs that touch upon such topics as insect migration, Arctic adaptations, keystone species, ladybug ecology, spider anatomy, lightning safety, scavengers, nature appreciation, ungulates, and the Appalachian Trail, interspersed with colorful, informative narrative. From Mighty Wolf’s title track, which doubles as an a cappella tribute toJeff & Paige’s son Wolf and is structured like a Renaissance canzonetta, to “The Great Monarch Migration,” a graceful acoustic song about a butterfly’s life cycle, Mighty Wolf is fully committed to its message, yet consistently maintains top-notch musical standards. Album highlights include a big vocal number with a great dance beat, “Black Widow,” which provides plenty of opportunities for kids to get dizzy by spinning in circles, “Triple Rainbow,” which just might become the latest and most ridiculous kids’ dance craze, “Grandma Gatewood,” an ode to the first woman ever to hike the Appalachian Trail, and “Dead and Delicious,” a real showstopper about roadkill, sung by a hungry raven! Listeners will note influences ranging from Primus, Ween, and Pink Floyd to The Beatles and Boards of Canada. The husband-and-wife team of Jeff & Paige met in graduate school at the Audubon Expedition Institute, where both were studying Environmental Education. After receiving their Master of Science degrees, Jeff Kagan and Paige Doughty decided to make the stage their science classroom and music-loving families their students. Based in Boulder, Colorado, they’ve released four albums and played well over 600 eco-friendly shows since hitting the boards with their first performance in 2007. I received a copy of this CD and love how fun the music is! I highly recommend for younger kids! Previous Jeff & Paige albums include Get Outdoors (2013), 21st Century Energy Superheroes (2011), Songs from the Trail (2009), andRocky Mountain Tunes for Rocky Mountain Kids (2007). Visit Jeff & Paige’s website HERE.